If I were to take a poll of all Greeks, Greek-Americans and Grecophiles (yes, that’s a thing) and ask them to name their favorite dessert, I think that Galaktoboureko would take the prize. If you’re not already familiar with it, Galaktoboureko (pronounced Gah-lak-toh-boo-reh-koh) is a traditional Greek dessert of thick semolina custard encased in paper-thin layers of filo pastry dough. After baking, it’s topped off with a citrus-infused simple syrup. Typically, Galaktoboureko is made in a deep 9×13″ dish and cut into squares after baking. Alternatively, it can be folded into individual rolls as I posted on the blog’s facebook page. 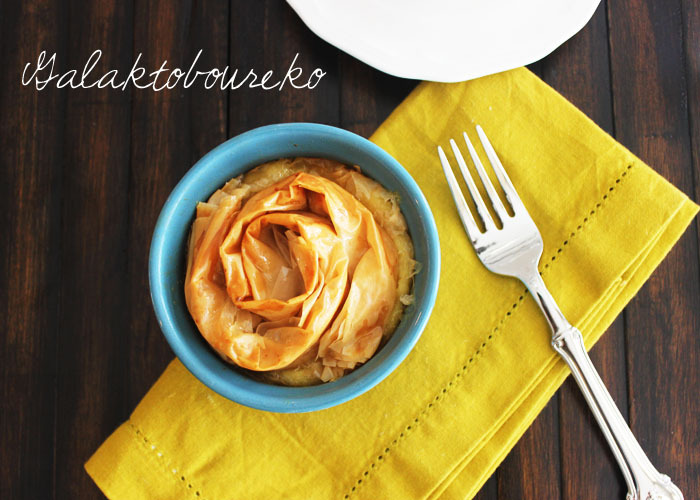 I usually go with either method, but this time I experimented and with galaktoboureko in ramekins topped with filo rosettes and this is the outcome–same amazing dessert with a little flair. TIP: When using filo, work quickly as it tends to dry up fast. Keep your sheets covered with a damp towel in between using. This makes working with filo so much easier. Heat the milk in a medium saucepan over medium-high heat until it is almost boiling. Stir in 1/2 cup of the sugar, the semolina flour and 1 tbsp of butter. Reduce the heat to medium and cook until thickened (about 5 minutes). Remove from heat. Beat the eggs, remaining 1/4 c of sugar and 1/4 c of the melted butter together in a medium bowl until frothy. Then, slowly whisk into the milk mixture. Stir in the vanilla and lemon rind. Set aside. Using a pastry brush, coat the inside of a ramekin with melted butter. Take one sheet of filo and gently tear in half. Place each piece in opposite directions to line the inside of the ramekin allowing extra filo to hang off the edge. Spoon the custard mixture inside the ramekin and fold the edges of the filo over to cover the top of the custard. Take two sheets of filo and each up from long edge to long edge. 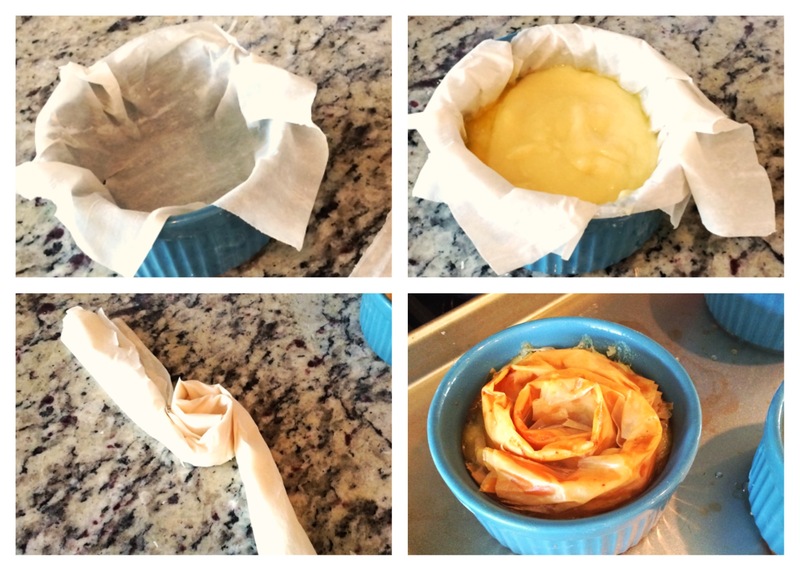 Twist the two rolls in opposite directions to make a rosette shape and gently press on top of the custard/filo. Brush generously with belted butter. Repeat for the remaining ramekins. Place ramekins on a pan and bake for 40-45 minutes. While the ramekins are in the oven, prepare the syrup by combining the ingredients in a saucepan and bringing to a boil. Stir and reduce the heat to medium allowing the syrup to simmer for approximately 15 minutes. Once the ramekins are out of the oven, allow to cool for 5 minutes before carefully pouring the syrup down the sides and over the top of each one. Allow the syrup to soak for at least a few hours or overnight before serving. Sophaki, I really like your new way to present Galaktoboureko…very creative! Thank you Peter- it means a lot coming from you!